Are those upcountry trying to crank up the cultural insults rate of fire to one a day, or just two a week? Following on from the UK Government’s inexplicable killing this week of all UK funding to the Cornish language, despite their clear domestic and international responsibilities, comes this latest. 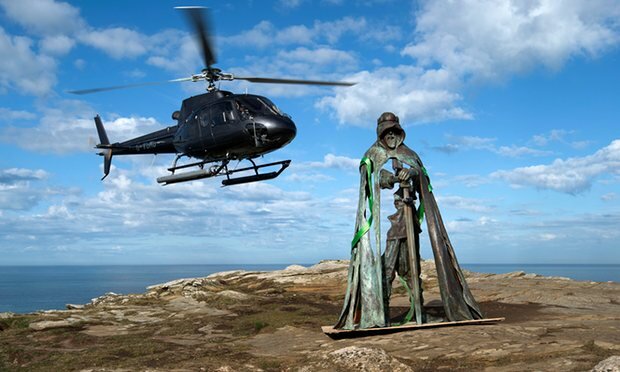 Helicoptered in, under great secrecy, perched above the Atlantic breakers, this imposing bronze statue of a regal figure (above) clutching a sword and gazing back across the ruins of Tintagel castle and towards the Cornish mainland is certainly impressive. More cultural vandalism. Will I love it? I quite like the rendition of form that the sculptor has done, so no insults to him, and in some other setting (entrance car park, or a courtyard) it may be quite appropriate. But not there! Not in this century! The clothing does not date it to the period of the real Kings of Cornwall or of even that of historic Arthur Dux, nor does the sword. It is a history and heritage fraud. But in the words of an Australian TV ad, wait there is more! NO it doesn’t mean that as you think it does! Gallos means ability; capability; know-how; might; power (ie. the power to do something). Nerth is the proper word they should use: might; power; strength; force; energy. An elementary Cornish student could have told them that. Did they ask? Who did they ask? Did they Google it? Why didn’t they ask Cornwall Council’s translation service – you know the one that no government funding is provided for! Yet, they could do better. Reading this below, you could be forgiven for thinking they actually had some cultural sensitivity … but then their bigger tourist dollar agenda blinds them. “When the Guardian was given a sneak preview, Jeremy Ashbee, English Heritage’s head curator, was on hand to explain why the statue was not just about Arthur. He explained that hundreds of fragments of amphorae had been unearthed at Tintagel from around the Mediterranean and north Africa, evidence that wine and olive oil was being imported in the dark ages. Locally made slate stoppers implied the goods were being consumed here and the vessels re-used. Ashbee’s theory is that Tintagel was the summer seat of a dynasty that ruled the kingdom of Dumnonia, which stretched across Cornwall and Devon and into Somerset in the fifth, sixth and seventh centuries. All spoiled by plonking a statue down on the Island, and a mangling of the language. If they wanted a non-eponymous name, then in the tradition of the time it could have been something more like ‘strong king’, but get a real speaker to translate it. Just to add to your piece about the desecrations at Tintagel, it is important to include that, as well as being a Scheduled Ancient Monument because of its archaeology, and Area of Outstanding Natural Beauty because of its landscapes, Tintagel is also part of a Site of Special Scientific Interest because of its geology. The rock formations tell the profound story of the formation of the Planet – it is, in tangible terms, the genesis story. In carving a face in bedrock to illustrate fabricated mythology constructed by Tennyson (who paid for his ‘sins’ by falling inexplicably off the garden wall at the Falcon Hotel, Bude and breaking his ankle, and who generously acknowledged Robert Stephen Hawker as a greater Arthurian than himself), and by drilling holes in the bedrock to anchor its 2.45m bronze statue of an Arthurian knight, ‘English’ Heritage has broken one of the key rules governing the Tintagel – Clovelly SSSI by drilling into the rock. It has also commissioned a bridge (very beautiful and ingenious, but in the wrong place) to link the island with the mainland, the footings for which will require further incursions and damage to the rock. It has not adequately taken into account the need to respect the equally strong designation of the rock – at least as far as we know – because all the procedures for considering and deciding on a Scheduled Ancient Monument application are conducted in private; no papers are published; no views are sought – in other words, the process offends against the basic principles of inclusion, transparency and accountability – which underpin modern governance. So, as well as imposing quite mediocre ‘art’ on a site which should be maintained as one of Britain’s most important archaeological, landscape and scientific site, the ‘steward’ of the site has obscured the truth and abused the greatest of its narratives – the story of the formation of the planet itself! Any reasonably self-aware Cornish person could have told ‘English’ Heritage all this, if they had bothered to ask.